Fleur Optekamp is a Sydney-based artist, designer, photographer and Subsonic regular since 2009. 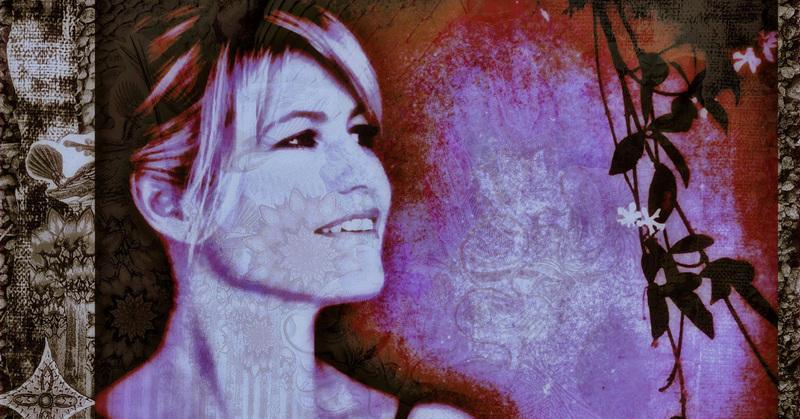 Inspired by nature, music, creatures, alchemy, space, travel, adventure and her sensory receptors, she has been influenced by various artists throughout her artistic journey a few such as Yayoi Kusama, Romare Bearden, Jerry Garcia, and Tycho. Hobbies include cruising her electric bicycle around Sydney, yoga, hanging out with her ducks, collecting weird and wonderful artefacts from all over the globe, creating all kinds of art pieces, and dancing to layered melodies. What inspired you to come up with this year’s core piece of artwork? 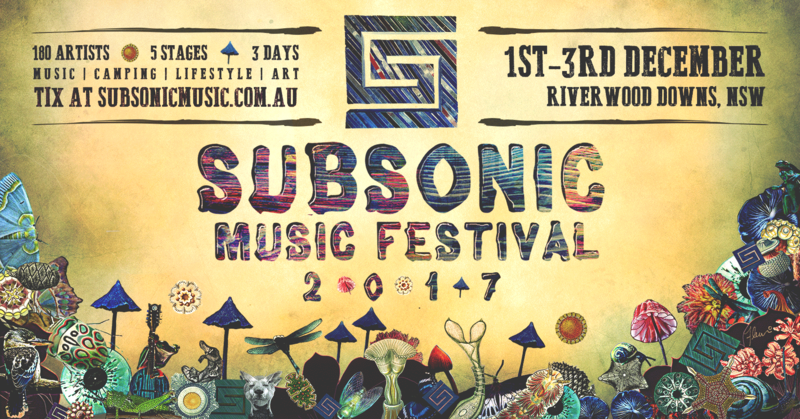 Subsonic 2016, actually. I did various guerilla live art installations throughout that weekend assembling a myriad of different items and materials in different formations and placing them around the festival grounds; cut outs of different shapes, creatures, botanicals and various fauna, as well as things that caught my eye in nature; pine cones, leaves and branches, which I painted in water-based colours. It was all for fun really. Placing my installations on random walkways or areas where nobody was expecting to see something extraordinary brought a smile to my face and hopefully to others. I carried most of the collage pieces with me throughout the festival but it wasn’t until the week after that I went to my favourite pond and assembled the elements in a way that is now the core concept that evolved into this year’s festival artwork. All other collage constellations stem from it. So what’s the concept based on? Nearly all elements in the collage are in some way native to the region. The insects, plants, mushrooms, birds, marsupials… we maybe don’t notice them, but they’re amongst us at the festival. We are all species originating from the same single cell organism which connects us all and are in this festival together, celebrating our life and existence, which I wanted to highlight. There are lots of kooky and strange elements weaved into the collage also which represent the openness and energy of the festival. That’s kind of what Subsonic is about – it’s colourful, vibrant, weirdly harmonious, mysterious and ecstatically fun. The entire collage ties in with this year’s festival theme “everything is everything, but not as it seems”. 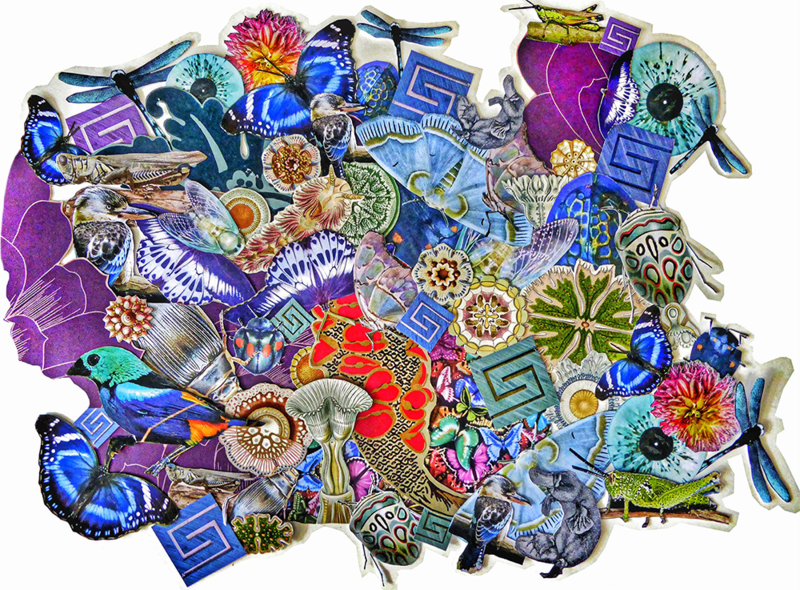 The mushrooms in the collage act as umbrellas for the creatures, I used fractal flowers as planets and added vinyls that could also resemble irises as well as speaker cones. I believe that nothing is static and that our perception of something doesn’t necessarily define its subsistence or the reality of it, which I hope I managed to bring across in the artwork. Fleur’s lovingly collated and designed collage creations and concepts have been transformed into this year’s festival artwork by Subsonic lead designer Gemma Van D, who also created this year’s logo, inspired by woodcut art at Subsonic Music Festival 2016 by Anne-Sophie Ridelaire & Gaetano Russo from Sydney art collective Le Petit Bateau.